Let's Start Coding is a hardware programming course that includes physical hardware and online educational material. It's based on an Arduino compatible Maker Board, it's grown-up coding but introduced in a gentle way. I tried out the Let's Start Coding kit with my 10 year old son. The age recommendation for the Let's Start Coding kits is 13+ but didn't have a teenager handy. More on age recommendations later. Disclosure: We were sent a Starter Kit and Ultimate Kit for the purposes of this review. As always our opinions are our own. Regular readers will know that this is the bit where we're actually interested in the box! We're a bit obsessed with storage especially for kits that have lots of small parts. The Let's Start Coding kits come in a lovely fold out storage box which is great for finding parts and perfect for packing them away until next time. We approve. We also like that the kits include a set of cards that explain the components and include commonly used reference information. The cards are kept together with a wristband which was a big hit with my son - he wore it while he was coding. There's also a sticker which found a spot on my son's overcrowded laptop. In the starter kit you get the Maker Board itself, an extension board for adding hardware, 3 single colour LEDs, two RGB LEDs, a speaker and 4 push buttons. You also get a nice retractable USB extension cable. In the ultimate kit you also get an LED strip, an LCD screen, sound, light and temperator sensors and a battery pack so you can create portable projects. When you open the box there's a sticker giving you the address of the website so you don't have to go hunting for it. Once on the site you're told how to connect the board. We had to use the included USB extension cable due to the position of the USB ports on my son's laptop. It's really good to see what a USB connector looks like inside. The instructions take you through installing a driver and a Chrome browser add on. My son whizzed through this and was soon starting the first lesson. Once you've installed the Chrome extension, the Arduino C++ code editor is embedded into the lesson and project web pages. The website says that the kit works on Windows, Mac OSX and Chromebooks. I quickly tested it on my Ubuntu Linux machine too. You don't need a driver for Arduino on Linux and you can install the Chrome extension. 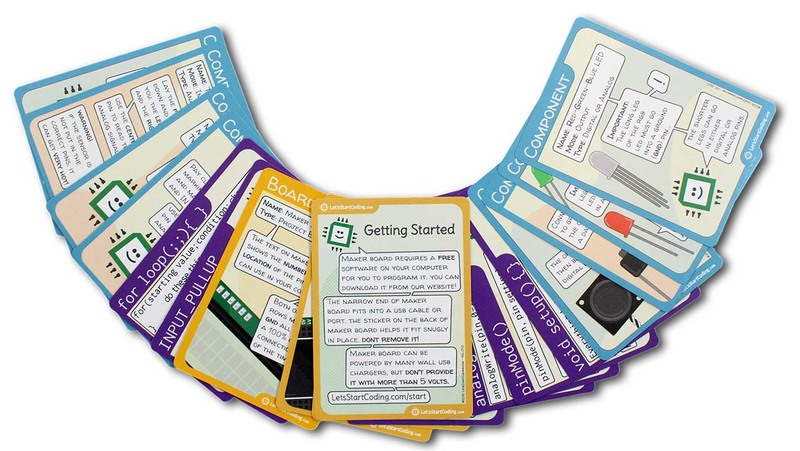 There are 14 lessons to get you started with using the Maker Board. Each lesson includes working code that you can download to the board straight away. There's also a video and an explanation of concepts. Learners then have to change the code to complete a set of challenges. In the very first exercise my son misunderstood the diagram as showing that the long leg of the LED goes on the left and the short leg goes on the right - it's the other way around, but I can see how he got it wrong. I think his prior experience went against him here, he knew he needed to find out which way around the legs went and thought he had found the info. Luckily you don't damage an LED by placing it the wrong way around and the power pins (which could damage the LED) are blocked initially which is a really nice touch. The error was easily fixed and I encouraged my son to look at the info on the cards! He didn't really have any trouble following the instructions after that. He loved the code editting approach. Each lesson begins with loading a pre-written program on to the Maker Board. Once it's working, learners work through a set of challenges that require changes to the code. This worked really well. My son can cope with typing text but he's not particularly fast which means it slows him down. This approach was a nice next step from working with block-based editors which meant that he could quickly get to the interesting stuff rather than spending ages typing boring set up code. Each lesson also has a quiz to test that the concepts have been learnt. There are also lots of projects which don't have as much supporting material but do have sample code to get you started. There's tons of content here which teaches some really useful stuff. For example one project gives an expected completion time of 8 hours to build and code an alarm clock using the LCD screen in the ultimate kit. My son immediately started using the lessons as a jumping off point for his own ideas and doing things that weren't in the challenges. He made the four button keyboard then added four LEDs so that they each would light up when a button different was pressed. The kit includes three LEDs so he asked his Dad for another one in a different colour. There's also an RGB LED in the kit which is used to create a similar extension to the project. The embedded editor works really well - you don't have to keep switching between editor and instructions. Because the instructions are challenges rather than step by step coding it wasn't a problem to keep scrolling between the challenges at the instructions. There's no way to create an account and save your work. There's not even a download button. So you have to be careful not to lose work. You can copy and paste the code out and into a text editor to save it. I can imagine a lot of frustration if learners lost work on a big project that they have put time into. The Ultimate Kit includes some pretty cool extras, as well as sensors and a battery pack you get an LCD screen and a strip of LEDs. 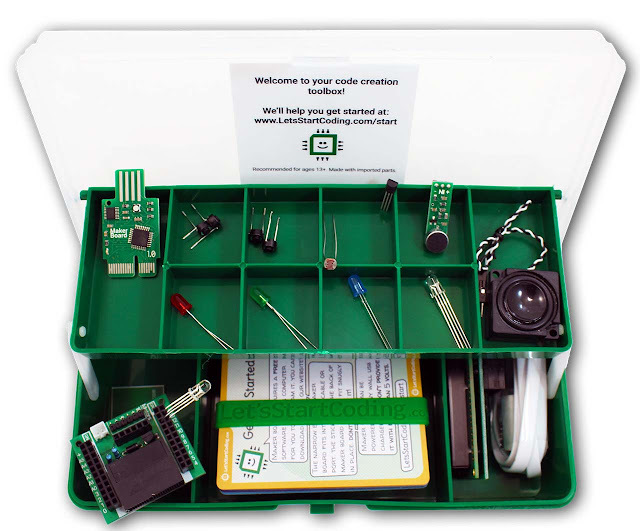 If you get the Ultimate Kit we'd actually recommend hiding the extra stuff until your learner has worked through the Starter Kit lessons and projects. Otherwise they'll just want to jump straight to the cool stuff without learning the basics. (OK, I admit it, I went straight for the LED strip ... My son has more discipline.) You can also buy an extension kit to get from the Starter to the Ultimate Kit. The LCD screen is a really nice addition. It allows learners to work at a much lower level than they're probably used to. It understands a set of characters (letters and numbers) and you can actually encode a few characters of your own design to load onto the screen. The age recommendation for the Let's Start Coding kits is 13+. I didn't have a teenager handy so I got my 10 year old to try it out (under supervision.) He has done some electronics before including BBC micro:bit programming and some bread board GPIO programming with the Raspberry Pi. 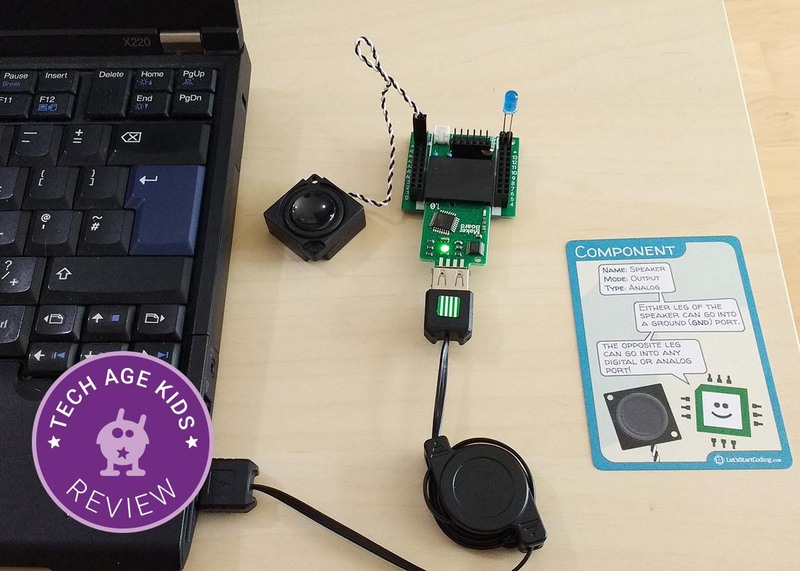 The kit uses Arduino C code so kids need to know their way around a computer keyboard. They also need to be able to follow instructions and be careful with electronics components which are delicate and fiddly. The early lessons and beginner projects are just the right level for him. A 13 year old would progress faster and the advanced projects mean there's plenty there for an older learner. Let's Start Coding has been a big success for us. It's a perfect intermediate step between beginner boards like the BBC micro:bit and an Arduino plus breadboard set up. 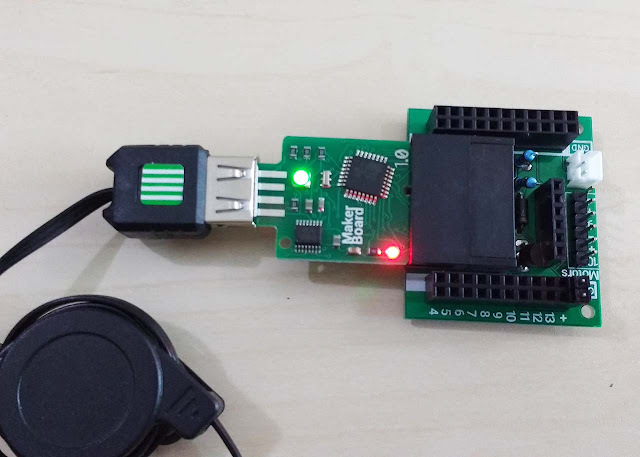 The form factor of the boards and the battery pack in the Ultimate Kit mean that the Maker Board lends itself to real projects rather than just learning. "Mum I want to do more with these kits." It looks like there's scope for future expansion too, there are pins labelled for motors (which aren't included in the current kits) and you can work with additional hardware. This is just an initial review of the kits. We expect to return to Let's Start Coding as we make projects with the Maker Board.